In our underwear/overwear line, another wonderful petticoat! 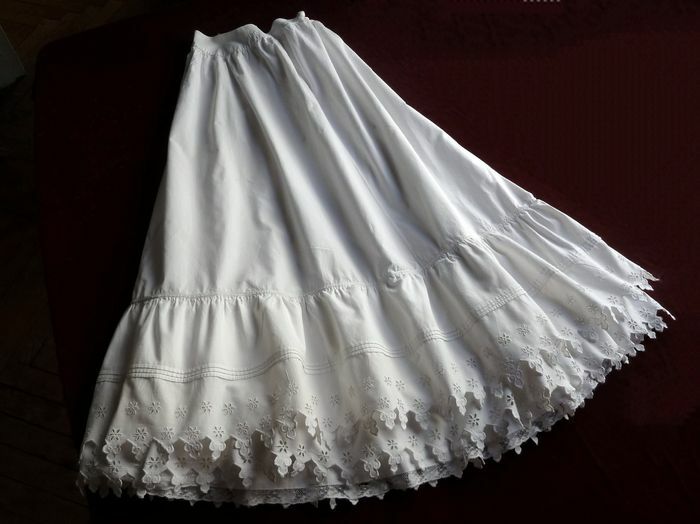 This fun and frilly antique skirt is made of a crisp, pure white and tightly woven cotton with a festive, elaborately embroidered triple flounce! The innermost ruffle is flat and bordered by a delicate Valenciennes style lace. The two outer flounces are very gathered giving them a densely ruffled fullness. Each one has long, intricately hand embroidered scallops and little English cut-work flowers decorating the panel above. The outermost flounce has three pin tuck pleats that run through the middle and a fine row of white work embroidery at the seam where it meets the skirt. The waistband is slightly wider in the front and is embroidered with a small white monogram, "BB." The opening is fully adjustable from a maximum of 74 in. and cinches with cotton draw strings that tie in bow. This wonderfully romantic petticoat likely dates from the late 19th century and is in excellent condition! Dimensions: overall length 38.5in., circumference of skirt flounce (at widest point) 104in., waist: adjustable with drawstring to widest circumference of 37in.